Competition just one year away (and the entry deadline approaching in March), it seemed a good question to ask of one of the organisers, Mick Wilson. In his day job, Mick and his brother Andy are directors of Clement Pianos. They’re the third generation of a family-run piano shop that was founded in 1919. ‘Being in the piano industry, we see lots of good pianists and we wanted to find a way to recognise them and get them noticed,’ explains Mick. They settled on the idea of presenting a piano competition, but soon realised that there were all too many classical competitions – and vanishingly few jazz piano competitions (there’s one, for example, that runs concurrently with the Montreux Jazz Festival in Switzerland). Solo jazz pianists seemed ‘desperately unsupported’, says Mick. After four years of discussion and planning, the Nottingham Jazz Piano Competition was launched in 2008. That first competition, won by Manchester pianist Dan Whieldon, was a success. 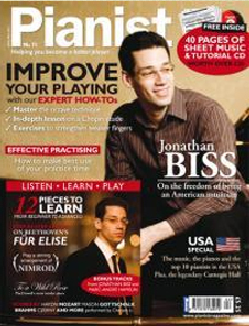 But the amount of interest from overseas pianists made the organisers realise they’d have to allow non-British pianists to enter, and the next two competitions were won by two New Yorkers – Logan Thomas (in 2010) and Jeremy Siskind (in 2012). Given the increasing strength of British jazz playing, no one would bet against a British winner for the next biennial competition, which takes place 3-5 October 2014. The 2014 competition also marks a change of supporters, with Bösendorfer, the luxury Austrian maker and now owned by Yamaha, and Pianist magazine as the media sponsor. All you need to go is to go the Nottingham International Jazz Piano Competition website Deadline for entries is 31 March 2014 The semi-finals and the grand final of the Competition are open to the public.